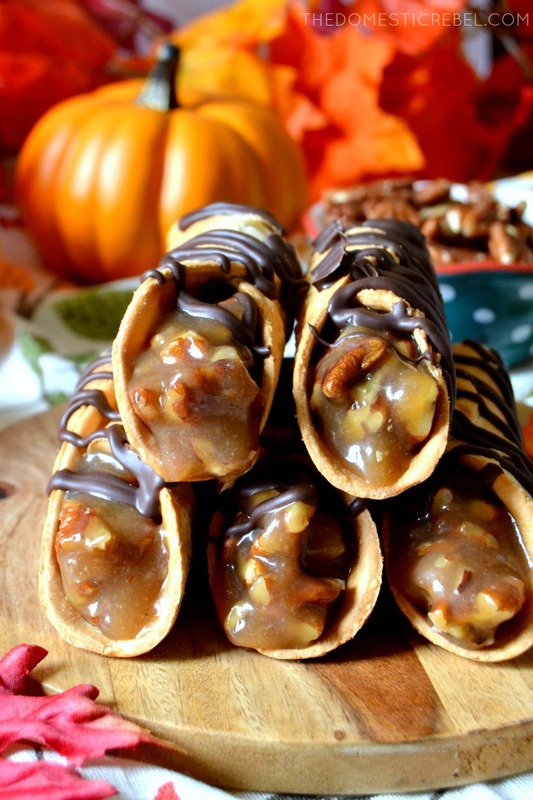 Yup, you read that right: Pecan Pie Cannoli are crispy, light cannoli shells FILLED to the brim with homemade, gooey pecan pie filling and drizzled with chocolate for good measure. 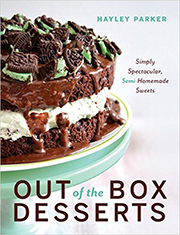 A totally unique dessert that’s sure to make everyone swoon! Guys. I did a thing. I made a pie cannoli. Pie-nolli. It’s still a working title, obviously. A lot of people ask me where I get my inspiration from, and it’s hard for me to answer without sounding like a complete nutcase. 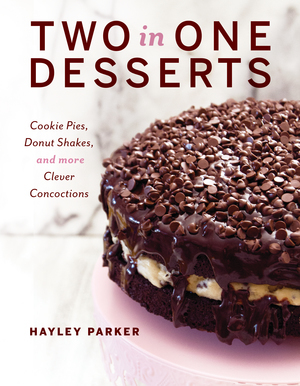 In short, I basically drive my cart down the baking aisle and stare at the ingredients for a very long time, telepathically willing recipe ideas to come to me as my eyes gaze over bags of flour, boxes of cake mix, and bottles of sprinkles. No, I’m not joking. I will seriously stand there, staring mindlessly into a bag of Reese’s peanut butter cups as my mind kind of ticks off recipe ideas. Reese’s brownies? Boring. Reese’s cupcakes? Done. Reese’s pie? Oh shoot, that’s actually a really good one! Don’t mind me, guys! Just trying to come up with the next viral recipe. Anyway, I happened to do my blog grocery shopping at this really gorgeous market we have here called Nugget Market. Nugget has regular stuff but also a ton of specialty imported things, including cannoli shells. I was perusing my baking aisle, AKA my natural habitat, when I spotted them in their bright blue box, staring me down and giving me the stink eye. How come you never make cannoli recipes? they asked in a Brooklyn accent. (This is all hypothetical of course; cannoli boxes don’t actually speak to me and if they did I wouldn’t admit that in case the mental hospital people are reading this and are getting the straitjacket ready). But it’s true: I have very few cannoli recipes on my blog only because cannoli isn’t super popular anywhere other than New York. But that changes now, and it changes with a huge overhaul of the filling. 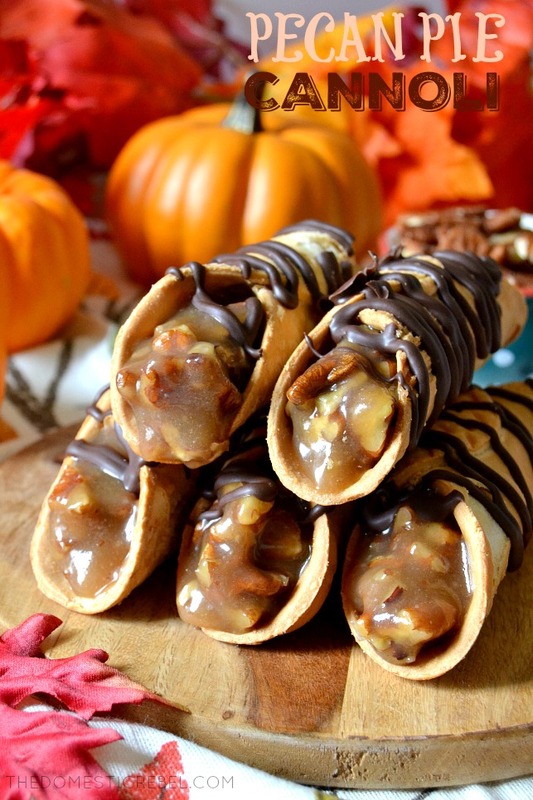 Now, these are true blue Pecan Pie Cannoli because they are made with homemade, from-scratch pecan pie filling. There is a disclaimer with this recipe, and that is: these need to be chilled up until the minute you serve them. Yes, you can make them ahead… but they can’t sit around while you futz with dinner and drinks. The reason being is because the pecan pie filling tends to seep out the longer it sits at room temperature. Still delicious, just not as presentable as they could potentially be if they remain chilled. Otherwise, these are a badass new way to enjoy cannoli and yes, I am patting myself on the back copiously for thinking of them. 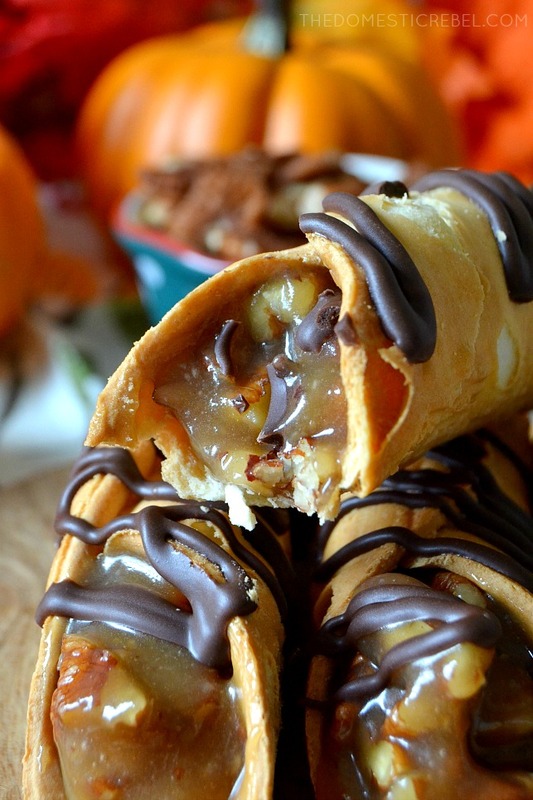 The combination of the crispy, light, flaky cannoli shell reminds me so much of pie crust, and then it gets filled to the brim with gooey, sweet, sticky pecan pie filling. The chocolate drizzle is totally optional; I just thought it made the cannoli look super pretty. A dusting of powdered sugar would look resplendent too! 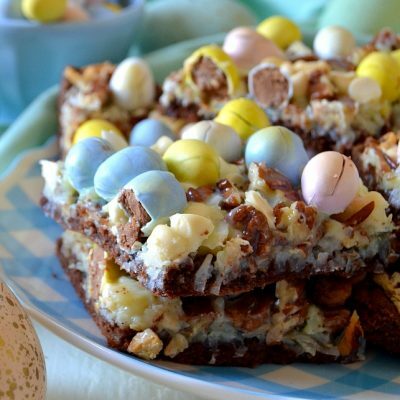 But seriously… if you aren’t making these now, what are you waiting for? 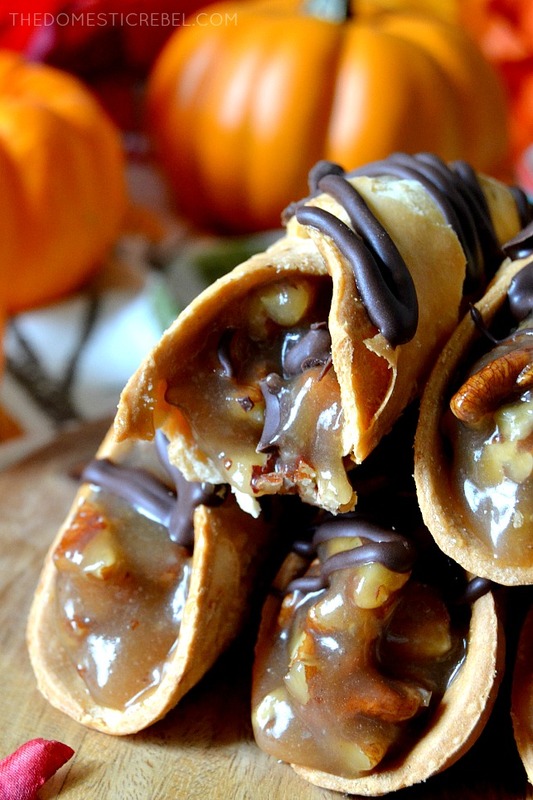 These Pecan Pie Cannoli are OUT OF CONTROL! Crispy, flaky, buttery cannoli shell is filled to the brim with scratch-made, stick-to-your-ribs gooey pecan pie filling. 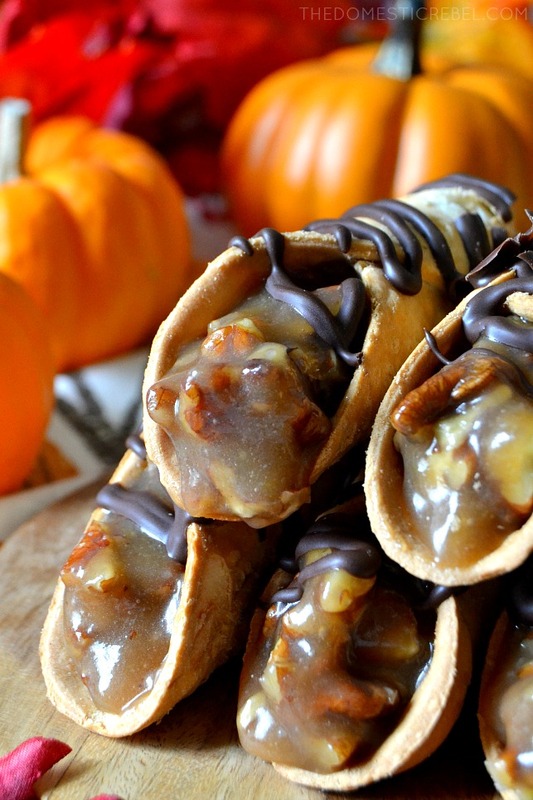 Such a fun and impressive twist on a pecan pie and an Italian cannoli! In a large saucepan, combine the granulated sugar, brown sugar, and cornstarch together. Whisk until blended, breaking down any clumps of sugar. Turn on the heat to medium. Add in the corn syrup, butter, salt, and eggs and whisk constantly and vigorously to incorporate the eggs to prevent scrambling them. Whisk constantly for about 5-8 minutes or until the mixture starts to boil. Remove from the heat and stir in the pecans and vanilla extract. Cool the mixture to room temperature completely, then refrigerate to chill for 2 hours or until thickened. Spoon some of the filling into a large disposable piping bag without an icing tip. Cut the tip of the bag off high enough so that the hole is big enough to accommodate pecans passing through. Pipe the pecan pie filling into one side of the cannoli, pushing the filling into the cannoli to fill it. Fill in any gaps on the other side of the cannoli, if needed. Place the cannoli on a plate or rimmed baking sheet and repeat with remaining cannoli. Refrigerate the cannoli for about 30 minutes -1 hour or until firm and set. Drizzle with melted candy melts, if using and desired, and let chill for about 10 minutes before serving. Store cannoli in the fridge immediately before serving. Disclaimer: this post contains some Amazon affiliate links. If a purchase is made using my link, I receive a small commission at no additional cost to you. Thanks for keeping my blog alive! Looks Amaaaazin’ and delicious! I will be making these tonight, I have a party this weekend that they would be perfect for. I will also be putting a tag on them with your website so everyone can see all the great work you’re doing!